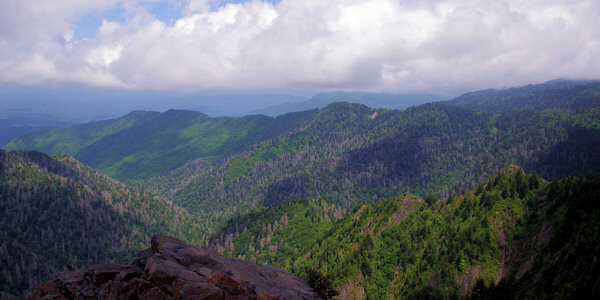 Perhaps the oddest-named mountain peak in the Great Smoky Mountains National Park offers the most amazing views! 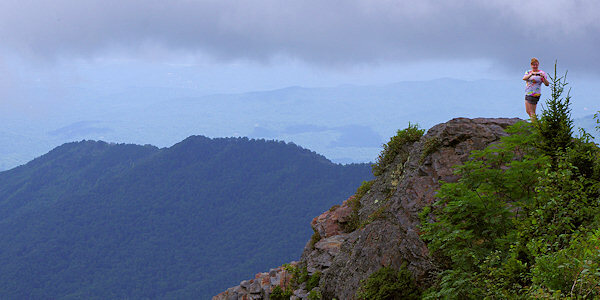 Hike the Appalachian Trail to the stone outcrop called Charlies Bunion. 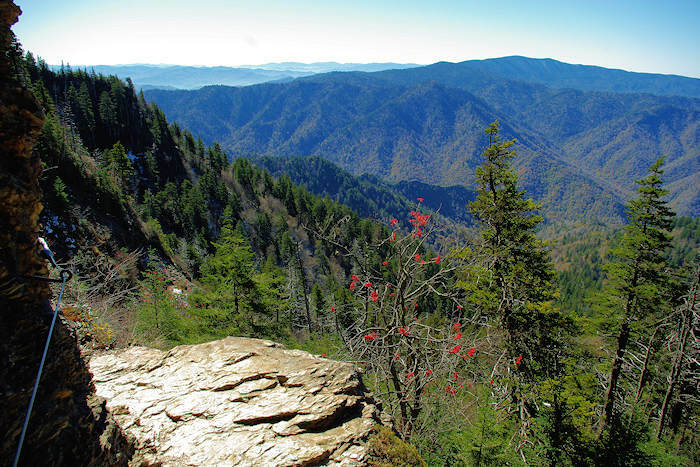 The rocky, treeless summit affords wonderful panoramic views of the Great Smoky Mountains, definitely one of the best in the entire park. 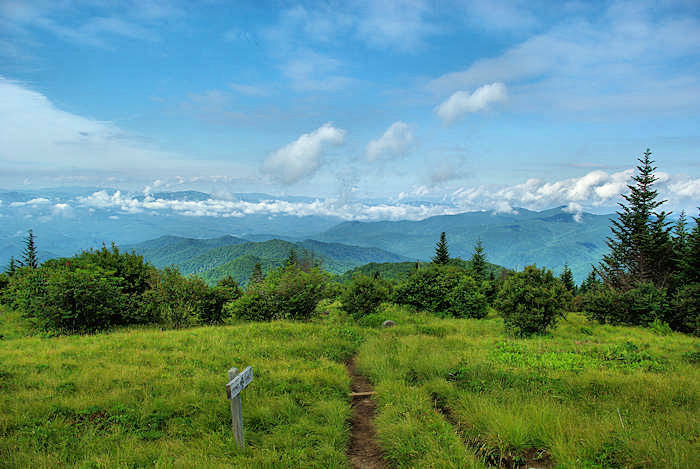 It's a 4-mile moderate hike (8 miles roundtrip) from Newfound Gap on the North Carolina/Tennessee state line, hiking north away from Clingman's Dome. While you climb more than 1,600 feet in elevation, it's a gradual gain. 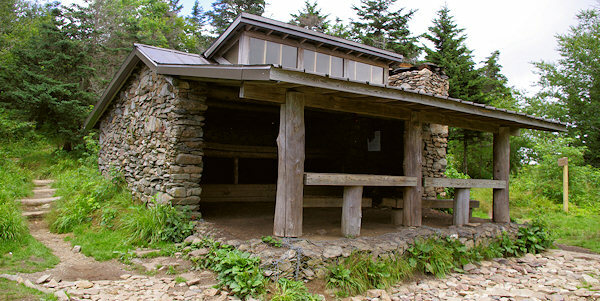 From Newfound Gap (elevation 5,049), you'll climb to 6,222 feet and then descend to 5,565 feet at Charlies Bunion. Pack a lunch for an amazing picnic spot! You're first great mountain views come about 2/3 of a mile up the trail, a great spot to stop and rest from the climb. At 1.7 miles is the intersection of Sweat Heifer Creek Trail junction is at 1.7 miles. (You can take a quick 25-yard detour up this trail for another good mountian view.) The highest section of this Appalachian Trail hike takes you along a ridgeline through a dense alpine forest. The fresh fir smells wonderful, especially after a rain. 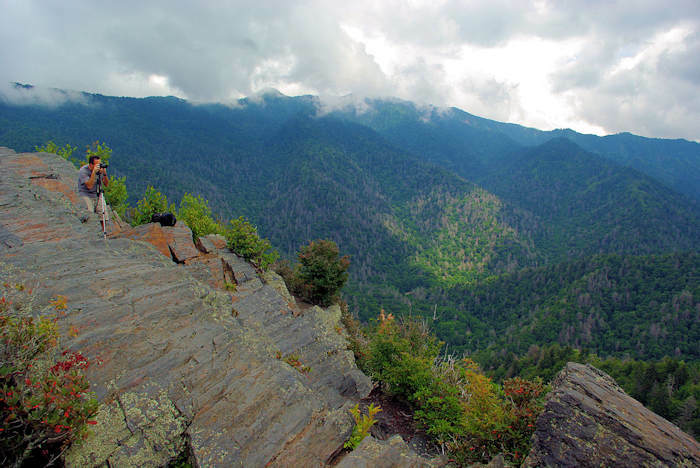 At 2.7 miles, the Boulevard Trail to Mount LeConte (and the nearby Jump Off) forks off to the left. Continue on the Appalachian Trail, passing the Icewater Spring Shelter in about 1/4 mile. You can great spring water here, but you should filter it. 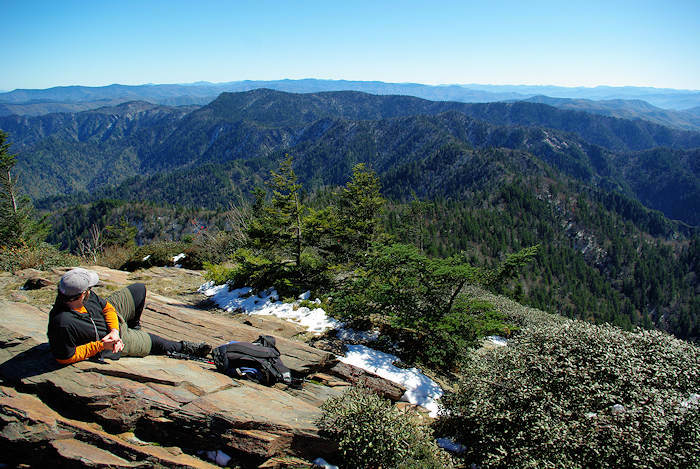 At about four miles, a short side trail marked "Charlie's Bunion" to the left takes you to the rock outcropping. This side trail loops around the summit and returns to the AT. Be careful, there are some very steep drops. So watch your step! There are a lower pair of outcroppings. The one nearest the trail is fairly easy to climb up and have a picnic. To reach the highest point of the summit, take a side trail off the AT, just past the first trail that takes you to the lower bunion. That side trail takes you on a quick climb to reach the very top! 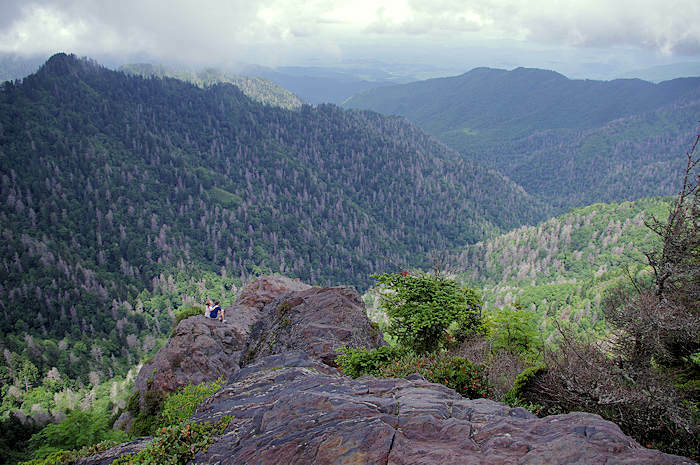 Charlies Bunion was named in 1929 for Charlie Conner's bunion on his foot, seen one day when hiking with Horace Kephart, one of the leading campaigners for the creation of the national park. The mountain rising above Charlies Bunion to the west was named after Kephart. Charlies Bunion which was formed by a fire in 1925 that killed trees and plants, followed by a flood in 1929 that washed away the soil. A backcountry permit is required to camp in one of the trail shelters or at a campsite. 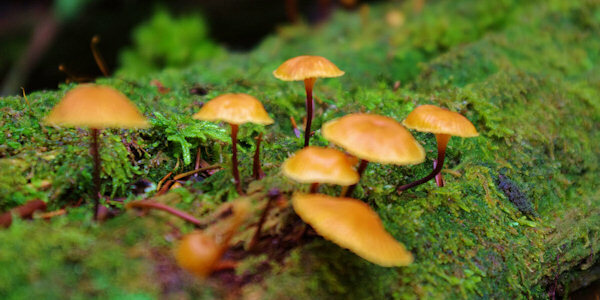 Other nearby hikes in the Smokies include Chimney Tops, Alum Cave & Mt. LeConte and Andrew's Bald. Allow two hours to hike up (with just a few stops) and about 1.5 hours to hike down. 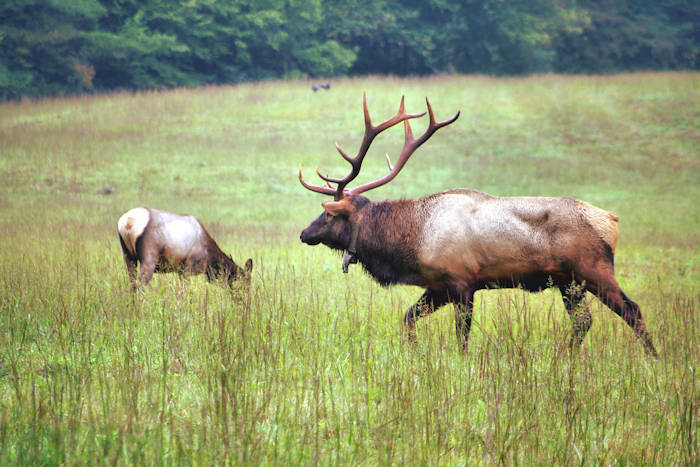 Plus, allow plenty of time to soak in the views and enjoy only the sounds of nature. Directions: Drive on Newfound Gap Road to Newfound Gap parking lot which is 13.2 miles from Sugarlands Visitor Center or 16 miles from Oconaluftee Visitor Center. The trailhead is to the left of the overlook, at the end of the parking lot near the restrooms.